The Feeney Law Office is committed to providing superior legal services in a cost effective manner. Our "innovative approach to law" includes reducing overhead and other expenses by locating the firm in upstate New York. With state of the art computers and experienced technical support personnel, we are capable of representing clients throughout the State of New York and beyond. This representation includes the ability to litigate in all New York State Courts. This innovative approach also allows us to reduce costs and expenses incurred by our clients by outsourcing other litigation support services. Mr. Feeney has over 25 years of legal experience in complex commercial litigation. He began his legal career as an associate with Milbank, Tweed, Hadley & McCloy – a prestigious Wall Street law firm with its principle office located in New York City. In 1997 he and his family returned to Ithaca, and shortly thereafter he became a partner of the law firm Thaler & Thaler. In 2005 Mr. Feeney started his own practice. Mr. Feeney is a graduate of Cornell University (BA 1986) and the Cornell Law School (JD 1989). 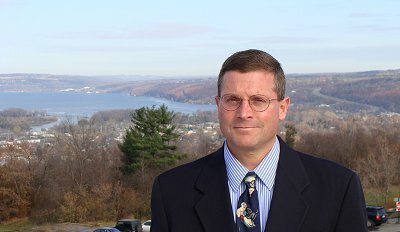 The firm is uniquely positioned "far above Cayuga's waters" with spectacular views of Cayuga Lake, Cornell University and Ithaca College. Although primarily focused on complex commercial litigation, the firm also represents numerous clients in other areas of law including real estate, contracts, commercial transactions, small business formation, corporate law, commercial leasing, personal injury litigation and basic estate planning. Before moving to Ithaca in 1997, Mr. Feeney represented large multi-national and domestic companies in commercial, mass tort and class action litigation in federal and state courts throughout the United States.